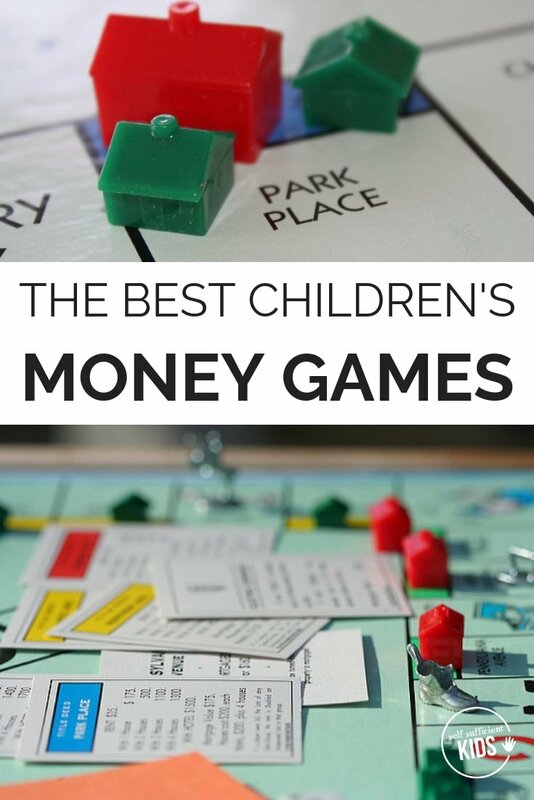 These money games for kids teach valuable lessons while still being fun. When was the last time your kids saw you pay for something in cash? Maybe it was at a local restaurant that doesn’t accept credit cards, or when you took out a few quarters to buy pretzels from a vending machine. But chances are your kids rarely see bills and coins exchange hands. What they’re more likely to observe is a plastic rectangle being swiped on the side of a small digital box that somehow magically lets you leave the store with whatever you came to buy. Living in a digital world, it’s difficult for kids to deduce what really happens when adults pay for things. For all they know, the plastic rectangle you pass through a credit card reader is only slightly different than the Go Fish cards used during your last family game night. Sure we could start paying for everything in cash – just so our kids understand how physical money works. But let’s be honest – credit and debit cards are easy. Besides, kids tend to learn better by doing things themselves. 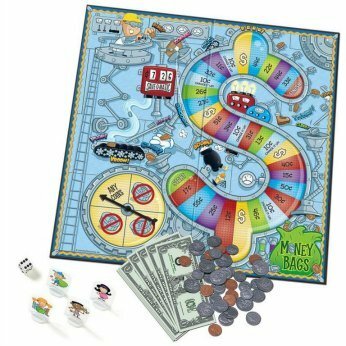 So playing money games that teach kids the different values of bills and coins, how to handle money, and even economics and entrepreneurship is a great way to introduce these concepts. 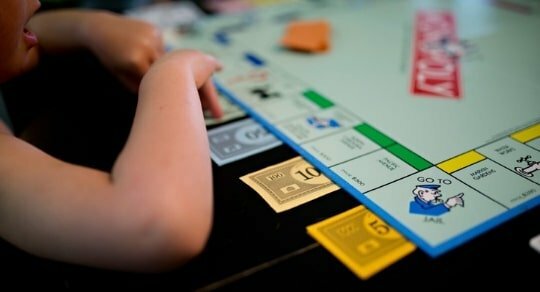 The following is a list of money games for kids that can help your children better understand American bills and coins. 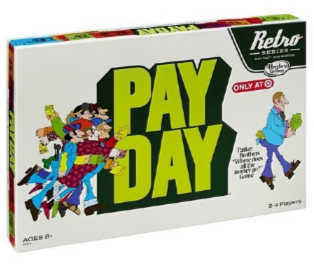 Besides using the real thing, these money games are the next best thing. The counting money games listed below are arranged according to kids’ understanding of counting coins and bills. The first few games are best for beginners while subsequent games help kids practice their knowledge. While not entirely a game, Money Match Me can be a fun way for kids to test their knowledge of American coins. One card shows a group of coins that need to be matched with both a numeric and written description. 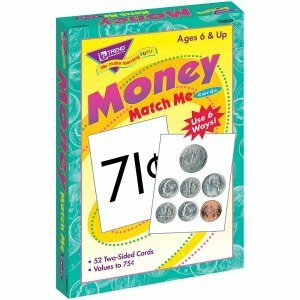 For example, a picture of three quarters would be matched with a card that says both 75¢ and “Seventy-five cents”. These cards can be a great way to introduce coins to children. Further skills of adding and subtracting and making change can be acquired with some of the other games listed below. If your kids need practice counting money and distinguishing between different coins and exchanging coins, the Money Bags game can help. As players move along the board they collect money from the bank but are constrained to specific coins. The game ends when the first player has moved through the spaces and reaches the last “End” space. The winner is the person who has the most money. While dollar bills are used in this game, the primary focus is on coins. 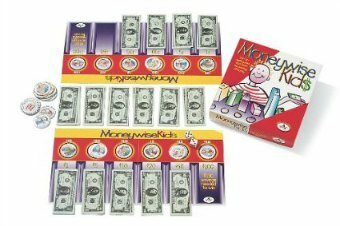 If your child has basic money and math skills but could use a bit more practice handling bills, Moneywise Kids could be a great game to play. The objective of Moneywise Kids (which is actually two games in one), is to let children experience what it’s like to handle money, make change, and practice spending and saving money. In the first game, players race to see who can reach $100 in savings first. 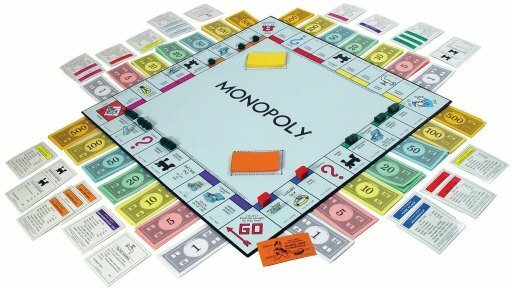 A bit of complexity is added to the second game since in addition to collecting $100, players also have to collect six Moneywise Markers which include paying for medical expenses, transportation, housing, taxes, clothing, and food. Since the focus is on adding and subtracting with different denominations of bills, this game is solidly educational, but thankfully also fun for kids to play. 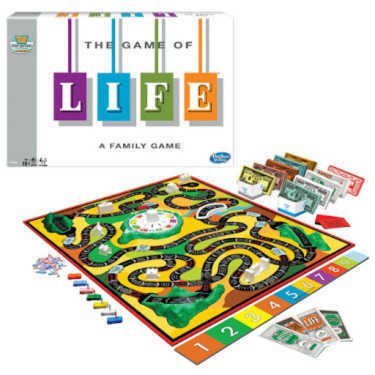 To see the full list of Money Counting Games for kids click here. 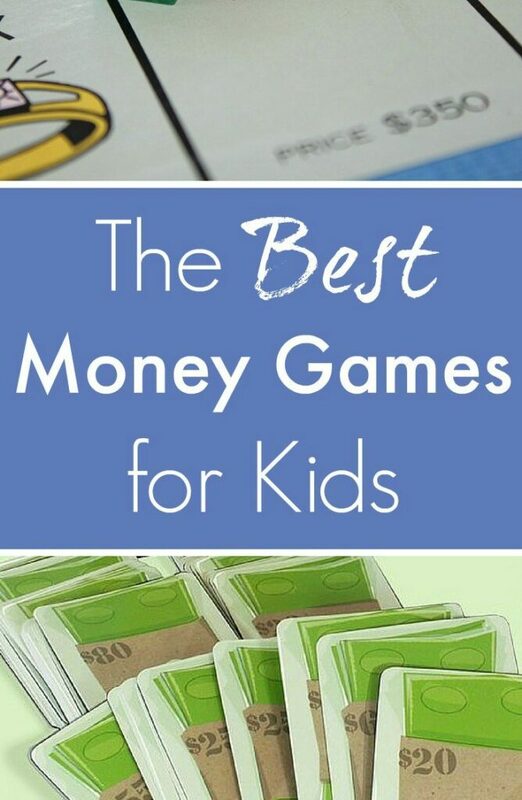 To see the full list of Budgeting Games for Kids click here. Apps provide another opportunity for kids to learn how to count coins and bills. Plus, they’re interactive and kids can play with them independently. While there are numerous apps that provide counting money games, the two listed below are really all you need. Not only do these apps teach kids how to count coins but they have the added benefit of being free. 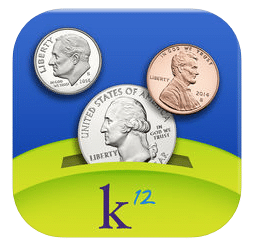 Counting Coins is a simple app that helps kids practice working with U.S. pennies, nickels, dimes, and quarters. There are four ways to play: 1) Match the value: try to make the same value as the coins shown on the screen using a different combination of coins, 2) Make the total: use the correct coins to make the total shown, 3) How many cents? : Type in the value of the coins shown, and 4) Show values: this feature tells kids the values of one or a combination of coins. This is the perfect app to introduce the concept of coins to kids. Be sure to also check out the follow-up app: Counting Bills and Coins. 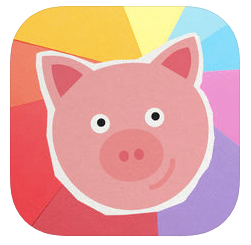 Peter Pig’s Money Counter allows kids to count and sort coins in three different games. Users can choose their skill level and whether or not they want to win rewards along the way. In the first game, kids place coins in the jar with the correct sign such as 25¢, 10¢, 5¢ and 1¢. 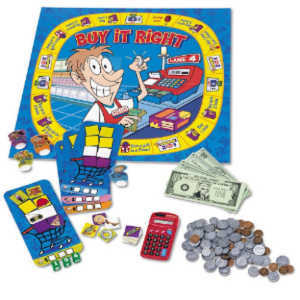 In the second game, kids count a selection of coins and the press a circle with the correct amount. The third game has kids count from two groups of coins and then decide which amount is greater. These games are all fun ways to learn how to count although children might need help at first to figure out what they’re supposed to do in each game. Cupcake! is my favorite kid app ever. I’m serious: ever. This program is so well-thought out and has a great balance of entertainment and teaching kids (and really teaching them, not “teaching” them) a number of entrepreneurial, math, and money lessons. The gist of Cupcake! is that kids run their own cupcake bakery but have to first buy supplies (and be aware of prices and sales), design two cupcakes, and set the price of the cupcakes. 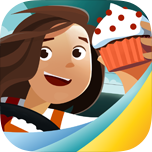 Once the cupcakes are made and ready to be sold, customers come into the bakery and give their orders with a twist such as “I want 9 cupcakes but 1/3 should be chocolate.” And to round it all out, the bakery owner (that’s your kid) has to deliver the cupcakes while navigating a grid. So much value jammed into one little app. Motion Math’s Pizza is also a great app and if you have a kid who’s more interested in pizza than cupcakes (there are some out there! ), this could be a better match. Just like Cupcake!, Pizza is an entrepreneurial game that lets kids run their own pizza store. The pizza owner has to balance buying enough ingredients to meet the needs of customers, setting a profitable price, and being able to do mental math fast enough to keep customers satisfied. This is also a great app that’s worth the price. Freefall money is the perfect app for kids who are still trying to figure out the difference between coins. The game begins with a few coins on the table and the child has to type in how much they are worth. The following questions include putting the correct amount of money into a piggy bank and determining how much groupings of coins are worth. At the end, the child can pick out their fish as a prize to keep in their virtual fish tank. To see the full list of Money Games Apps click here.